These action cameras will capture your thrill rides, but which is the best? Resilient and waterproof, action cameras enable extreme-sports enthusiasts to capture their feats in brilliant high definition. Sure, the feats are impressive, but it's the innovation of these small cameras that stands out. Their diminutive size and weight enable them to be attached to flight suits, vehicles and people, causing little obstruction, while their easy operation enables those with no previous shooting experience to film like a pro. Check out our guide to the best action camera. In 2013, market leader GoPro upped the ante with its Hero3. For the first time, here was an action camera that could shoot in 4K – albeit only at 15 frames per second, which made for disappointing playback. GoPro's latest 4K model, the Hero4 Black, takes the fps up to 30 in NTSC format, and the footage is so much better, offering smooth motion and clear detail – perfect for capturing that ski run or daredevil mountain-bike ride. But GoPro is not the only option for 4K shooting – Panasonic's HX-A500 and Sony's X1000V are also vying for your cash, and T3 is here to explain the pros and cons of each, so you can choose the one that best suits your needs. GoPro has been the leader of the action- camera pack for years, but how does its 4K footage rate? A two-part design and a large display are the HX-A500's selling points – but are we sold on it? Sony leads the field when it comes to digital image quality, but will its compact 4K camera live up to the name? Who rules the roost in terms of build quality and layout? is that two-piece design, which is meant to add versatility (you can, for instance, mount the main unit on your handlebars while wearing the separate camera at face level, to film exactly what you're seeing). For us, though, this adds an unnecessary level of complication to what's meant to be a fun hobby. To its credit, Panasonic's camera has a 1.5-inch screen that enables you to clearly see what you're filming (albeit in low resolution), while those large buttons make recording off the cuff a cinch. The Hero4 Black could never be described as pretty – in fact, it's about as boxy as a block of LEGO – but it's as tough as nails, and that's what you really want from an action camera. It's also ridiculously easy to mount – although it does tend to sit proud on top of a helmet or board, making it prone to being dislodged. Again, there's a screen for viewing footage, while the small settings display on the front of the camera is easy to navigate. the positioning of the record button on the top of the unit simplifies shooting when you're holding the camera in your hands. Wrapped in a standard housing, the camera is waterproof to 40 metres. The settings screen offers no frills but is pleasingly simple to navigate. The settings menu is a bit limited, though the scrolling system is easy. The controls are intuitive, taking the stress out of filming. The large record button on the top of the camera makes for easy shooting. Even in its waterproof housing, the X1000V is a slim fit. The X1000V is sleek, light and comfortable in the palm. The Zeiss lens looks smart, while the top-mounted record button is handy. We've established that all three of these cameras shoot in 4K, so their footage must be pretty much the same, right? Well, it's not quite as black and white as that. For a start, they don't all shoot in the same frame rate: the Hero4 Black and the X1000V both offer 30fps, while the Panasonic only manages 25fps. But even then, there are other things to consider. For example, if you live in the UK and you want to play your footage directly from your camera to your 4K TV, you'll need to set the video format to PAL, which immediately gives all of these cameras a maximum frame rate of 25fps. Happily, if you want to get the best out of your GoPro or Sony, there's a way around this: both cameras enable you to switch between formats, so you can record your footage at 30fps in NTSC format, then edit your footage on a computer to benefit from the smoother motion afforded by the extra 5fps. The HX-A500, however, is region-specific and set to 25fps in PAL regions. An extra 5fps might not sound like a lot, but comparing footage from each of the cameras on a computer shows just how much difference it makes. Both the Hero4 Black's and the X1000V's footage was satisfyingly smooth, clear and crisp – though 30fps is still slightly limiting as motion picks up. In terms of dynamic range, the Hero4 Black just about takes the edge; filming clouds, for example, we could make out clear definition, with little to no burnout. The HX-A500's footage does lag behind its rivals, but it's not going to make you recoil in horror. Yes, we found that it struggled in low-light conditions, with grain showing in areas of flat tone; and while the wide-angle- view option is useful for filming what's in your peripheral vision, it distorts the image somewhat. But on the plus side, the colours are rich – and, let's not forget, with that head-mounted camera you get a slightly different perspective to what the other two devices offer, making your films a bit more unique. GoPro Hero4 Black - The Hero4 Black's 4K video is packed with detail, and captures plenty of shadow and highlight tone. Exposure and white-balance adjustment are handled well when moving from light to dark, and the top frame rate of 30fps in NTSC just about keeps motion smooth as long as it's not too fast. Panasonic HX-A500 - Colours are well controlled in the HX-A500's footage, though areas of flat tone do show signs of noise. Move into a shaded area and the noise becomes very noticeable. Detail is also well produced, but it's still some way behind the standout quality of the Hero4 Black and the X1000V. Sony X1000V - A good amount of the tone within a scene is captured, and when the footage is shown back on a 4K TV you can see plenty of fine detail. Contrast and saturation give the footage impact, while the 30fps in NTSC ensures that motion is smooth (as long as the camera is kept steady). Smooth motion and fine detail give GoPro's camera the edge over the Sony. The Panasonic is a level below. What do these cameras offer besides sound structure and nice footage? Still undecided as to which action camera is the one for you? Then it might well boil down to the features each one offers. The Hero4 Black's audio-recording capabilities have been improved over previous GoPro models, but you can also acquire an optional 3.5mm input accessory to attach an external mic. This is quite an important asset for us, as there's nothing more irritating than having to listen to muffled sound while enjoying spectacular high-def footage. Elsewhere, the GoPro features a neat Time Lapse mode that captures a burst of stills at intervals of 0.5 to 60 seconds, which is great for shooting the different stages of a ski jump or skateboard trick. And here at T3, we're big fans of the GoPro's Protune software, which has been updated to offer a plethora of new ways to enhance your video. The Panasonic camera offers effective image stabilisation, which stops you from getting seasick when you're watching your footage back, but its accompanying app could do with being updated – it's certainly nowhere near as good as the GoPro one, for example. There's also a loop-recording option with this camera, where your oldest clips are replaced by new ones to save storage. Whether that's a help or a hindrance depends on your requirements. The Sony has a clever feature called the Highlight Movie Maker, which takes the best parts from all your videos (based on motion gyro, rather than some kind of magical ability to calculate what's a great snowboard trick and what isn't), and edits them together. There's a stereo mic with wind reduction, which means you can make out what people are saying without having to crank the volume up on your TV. And, if you're feeling particularly ambitious, there's also the ability to control five action cameras at once using your smartphone or tablet. Before choosing your camera, it's worth researching each one's features a bit more thoroughly, to help you weed out the useful characteristics from the gimmicks. The GoPro app enables easy control of your Hero4 Black, as well as linking you to the GoPro community. You can quickly access a range of settings, while the live-view screen enables easy start/stop recording. The Panasonic app's home screen includes simple links to remote operation and image transfer. Handily, the app makes it easy to transfer between shooting video and taking still images. A huge start/stop record button on the Sony app's interface makes remote shooting a simple process. In-app editing is a great feature that enables you to view and splice your footage on the move. Improved sound, a Time Lapse feature and excellent editing solutions mean the GoPro just pips its rivals. T3 rates: The Hero4 Black is small, lightweight and tough, and shoots high-quality 4K video – the footage is characterised by vibrant colours and plenty of detail. T3 slates: The box-like design means it stands proud when mounted on a helmet or surfboard, so it's prone to being knocked. Frustratingly, the HDMI output on the side of the camera will only churn out footage in HD. T3 says: The Hero4 Black is a great all-rounder. 4K footage is excellent, with good colour, detail and tone. Despite the 30fps maximum, the footage is still smooth. T3 rates: The slender design makes it great for mounting on the side of vehicles; colours are vibrant in 4K. T3 slates: Highlight detail suffers in bright conditions. T3 says: A sleek camera that films commendable 4K footage. T3 rates: The easy navigation. T3 slates: 4K video quality is limited; the design is fiddly. T3 says: The HX-A500 is a decent enough action camera but falls short compared to these prestigious rivals. Get the most out of your Hero4 Black with T3's pick of essential extras. Ever wanted to know what it's like to see the world through your dog's eyes? This simple, and harmless, attachment will provide the answer. Prefer the versatility of being able to carry your action camera by hand? Attach this simple contraption and you'll be filming shake-free clips in no time. The Bug consists of interchangeable filters, including neutral density and polariser, that will add impact to your footage. Machined from aluminium, this mount will hold the Hero4 Black firm and fast to your bike, helping to eliminate wobble when you're slaloming between the trees. This hardy housing features a convex mirror that sits directly in front of your camera's lens, enabling you to capture a 360-degree view of the world that can then be converted via software for your viewing pleasure. Liked this? 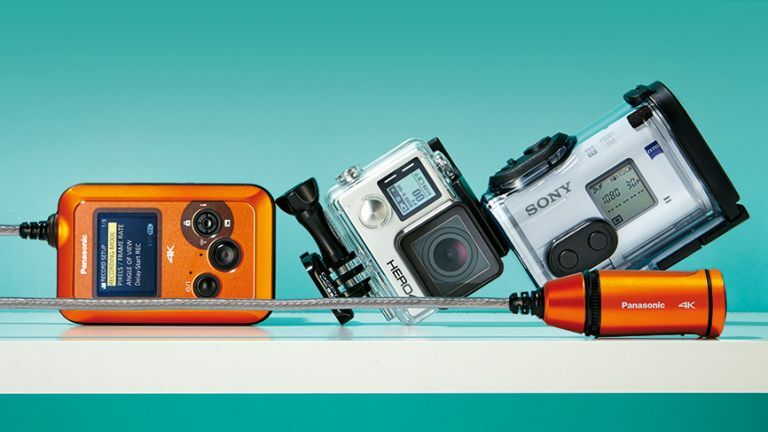 Check out our guide to the best action camera.